2 HOLES / 2 SIZES: Dramatically improve your putting game fast by practicing with our smaller cup sizes. While the standard golf hole is 4.25 inches wide, our uniquely designed cups of 3-inches and 2-inches will help you develop laser precision accuracy. Don't waste time practicing with a mat that is "too easy." Our putting green will help you cut strokes off your game now. As the pros say, "small target, small miss!" ADJUSTABLE GRAVITY BALL RETURN: Want to make your putting efficient with just 10 minutes of practice time? The Adjustable Gravity Ball Return rolls the ball to the specific length of putt you are practicing. No need to waste time walking to the hole to retrieve the ball again and again. Also, the holes are positioned on a slight uphill grade, training you to hit putts 12 inches past the hole if missed. No more leaving putts short! HIGH-QUALITY, DURABLE TURF ROLLS UP FOR EASY STORAGE: The Dual-Track ProEdge offers incredible durability compared to other lower-quality putting mats. The true roll turf provides a realistic putting surface consistent with a high-end golf course. Depending on the underlying surface, the green delivers a stimpmeter rating of 10-11. For easy storage at home or at the office, the green simply rolls up and fits conveniently in a closet or empty drawer. 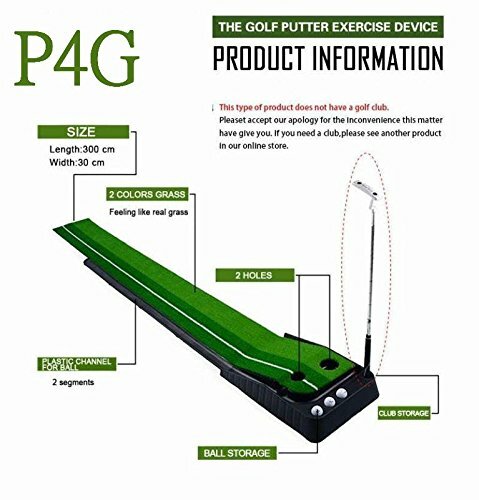 If you have any questions about this product by P4G, contact us by completing and submitting the form below. If you are looking for a specif part number, please include it with your message.